Snowboarding was unavailable to kids younger than 7 until Burton Snowboards developed first timer-friendly snowboards that are soft with flexed convex bases and beveled edges. These kids snowboards are easier to turn for a youngster and they resist catching an edge helping to prevent falls. The Riglet Reel is a retractable cord attached to the front or nose of the snowboard for instructors or parents to tow kids during their initial rides on the snowboard. These rides might be on the snow or on the carpet but they give the young snowboarder a successful feeling of sliding, achieving balance and control. 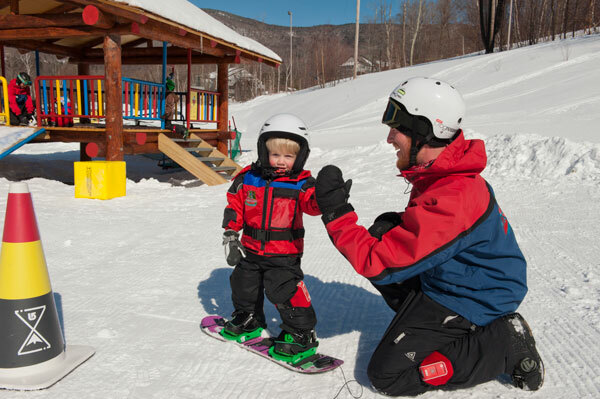 The development of terrain-based instruction areas and Riglet Parks at ski areas is another successful development to make it easier to learn how to ride. Riglet Parks are specifically designed for kids aimed at 3-6 year olds with fun-friendly kids-sized terrain inside a small snow bowl. There are more than 40 ski resorts using Riglet Parks and many others that are using terrain-based instruction areas, which are similar to the contained bowl kid parks. These areas are created with machine-made snow and can be shaped quickly with a snowcat. This terrain keeps the learner from leaving the park area and removes fear from sliding out of control. The concept has shown to allow faster technique learning progression. The instructor/student class ratios are 4:1 and 6:1 and most of all “the kids are not crying.” The program also introduces kids to snowboards on a carpeted area. There are various indoor exercises that emphasize the balance and sideways stance associated with snowboarding, before putting them on snow and snowboards. Getting more kids familiar with snowboarding and providing a successful introduction to the sport could very well reinvigorate the statistics, which have shown a decline in the number of snowboard population in the last few years. For more tips on learning to snowboard, and Snowboarding 101, and finding the best ski and snowboard camp for your kids, see all of our Family Ski Tips.